When your life is full of amazing views and big moments, it's hard not to share them all. Make the COOLPIX AW130 part of your go-to gear and start turning those radical moments into photos and Full HD videos that amaze. 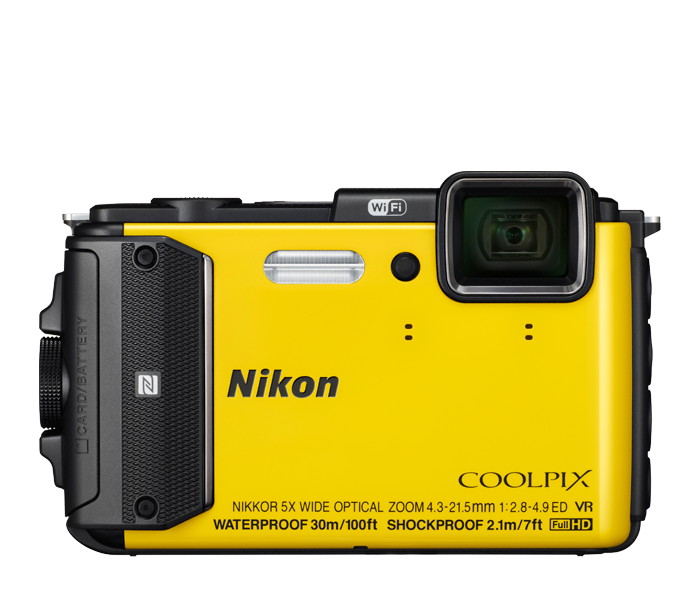 Waterproof, shockproof and freezeproof†, the COOLPIX AW130 is ready for adventures. With built-in Wi-Fi® and Near Field Communication technology (NFC)**, you can transfer your photos right to a compatible smartphone so you don't have to wait to share them; and built-in GPS records your coordinates and maps your shots. Strap the COOLPIX AW130 to your chest with Nikon’s optional harness and create jaw-dropping first-person photo sequences and videos that'll make your friends feel like they were there. And since it's a Nikon camera, the COOLPIX AW130 and it’s wide-angle (24mm equivalent) NIKKOR glass lens delivers image quality in a class of its own, even in low light. Quickly and easily send photos wirelessly from your Wi-Fi & NFC enabled COOLPIX AW130 to a compatible smartphone or tablet± using the Wireless Mobile Utility app. Share your great photos on the go, even in remote locations, or use a smartphone or tablet to control your camera. Relive the excitement of your travels in a whole new way. The COOLPIX AW130 records the exact location of each shot you take, so you can follow the path of your adventure and every stunning view along the way! Share your journeys on Google Maps™, Google+™, and other social networking sites, or with the downloadable Nikon View NX2 software. Built-in mapping and Electronic Compass also help you navigate unfamiliar destinations, and Points of Interest (POI) show you nearby photo-ops like scenic lookouts and historic landmarks. The COOLPIX AW130 is the ultimate travel companion! When you're underwater or atop a mountain, you want to capture the amazing view—all of it. The COOLPIX AW130's wide-angle (24mm f2.8 equivalent), 5x optical zoom NIKKOR glass lens provides a wide field of view that's great for those moments. Vibration Reduction (VR) offsets camera shake to keep your photos sharper and your videos steadier—crucial for an action camera. And if 5x optical zoom isn't enough reach, there's Dynamic Fine Zoom, an enhanced digital zoom function that effectively doubles your reach to 10x zoom. Create amazing action sequences with the touch of a button. When the action speeds up, just hold down the shutter button and fire off up to 5 shots per second (5 shots continuously). You'll get views of fast-moving subjects you may never have seen. With the press of a button, the COOLPIX AW130 becomes a high-performance video camera. 5-axis Hybrid Vibration Reduction (VR) helps you shoot stable, smooth videos without a tripod, and a built-in stereo mic captures high-fidelity sound. Shoot stills while you're recording video, combine short clips into a 30-second montage, even create amazing time-lapse movies right in the camera. There’s nothing worse than a shaky handheld video. As soon as you start recording with the COOLPIX AW130, Hybrid VR (Vibration Reduction) activates and combats camera shake for sharper steadier home movies. The COOLPIX AW130's large, Wide Viewing Angle OLED display makes it easy to compose your shots or monitor your video recording. Reviewing and sharing your creations is a pleasure, too—every shot looks fantastic on the display. It's frustrating when a smartphone camera focuses on the wrong thing. With the COOLPIX AW130, Target Finding AF quickly determines your intended subject and puts the focus where it belongs—on your subject. More creativity at your fingertips—even if your fingertips are enclosed in ski gloves! The COOLPIX AW130's handy Action Control feature makes it easy to adjust specific camera settings. Wrapped up in the action with no time to change settings? The COOLPIX AW130 automatically adjusts camera settings. And if you're looking to add creativity, select in-camera effects such as black and white, or selective color. There's even an underwater mode to keep images colorful and properly exposed.